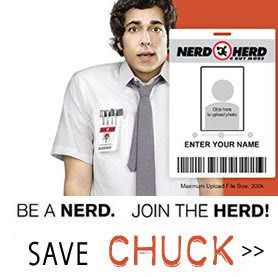 Life as we know it...: SAVE CHUCK! Chuck is one of those light hearted, fun, but interesting and well written shows that are hard to come across. Don't get me wrong, I love Lost, Heroes, and 24... but sometimes you just need a little humor with your gun weilding bad guys. That's Chuck. The adorable, loveable, secret Spy that doesn't want to be a spy, all American guy. How can they even think about taking him off the air?? I'm definitely in the Save Chuck camp, and hope anyone that reads this blog will go out there and talk about how much they too love Chuck, or at least how much they love their friend Terri who loves Chuck, so it should be kept on the air! SAVE CHUCK!!! UPDATE: Yeah!! NBC renewed Chuck! We have to wait until March 2010, but hopefully it will be worth the wait!